Budding entomologists are invited to join TRoutreach Saskatchewan and the Entomological Society of Saskatchewan for a day in the sun and stream collecting insects. The Entomological Extravaganza is scheduled for August 18 at Pine Cree Creek in the Cypress Hills. 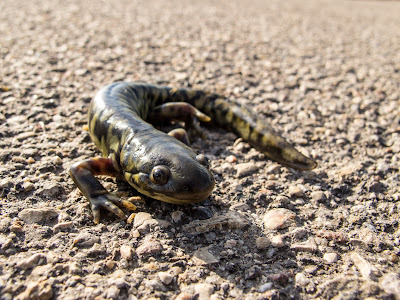 Show your support for Saskatchewan’s endangered species by voting (up to once a day) for Nature Saskatchewan who are participating in Jamieson’s Call for the Wild competition. Jamieson will be giving out $100,000 to five competing organizations, based on the votes they receive. The funds will help support Nature Saskatchewan’s Stewards of Saskatchewan programs. 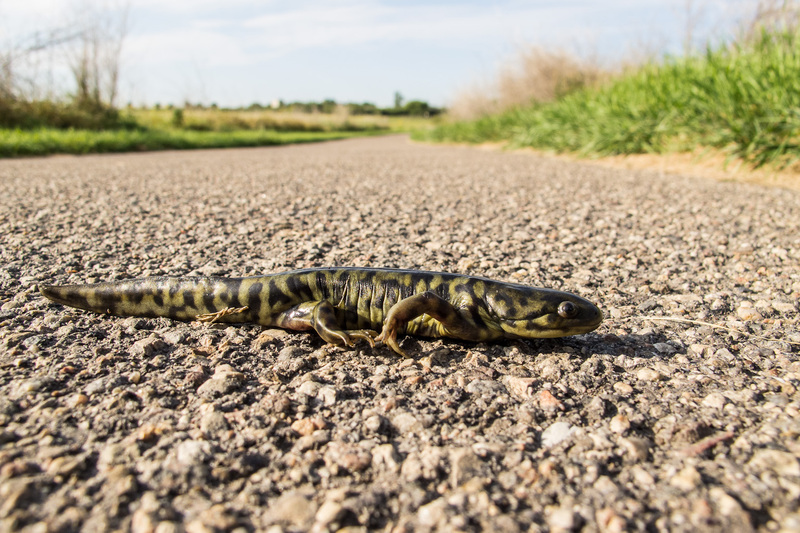 Andrew McKinlay recently spotted a couple of tiger salamanders on the Meewasin Trail. Tiger salamanders are the largest land-dwelling salamanders on earth (up to 14"/35 cm in length). They live in deep burrows up to 2 ft/60 cm below the surface. They emerge at night to eat worms, insects, frogs, and even other salamanders and can live on average 10-16 years in the wild. Fifteen percent of Sage Grouse die because they get caught in wire fences. Plastic clips hooked on fence wires are a simple, effective solution. The federal government has refused to list three species as endangered. Is this a reasonable decision, or is it the thin edge of the wedge? The Ottawa Citizen has an excellent review of the topic. For more information, you can follow Laura the Dragonfly, the Sierra Club of Canada’s spokesperson, on Facebook or Twitter. CPAWS is urging Canadians to respond to Parks Canada’s on-line questionnaire about Rouge National Urban Park in Toronto. CPAWS believes that the park should have a strong legal mandate prioritizing conservation to avoid the risk of being overrun with visitors and "loved to death." The Government of Saskatchewan is asking for public feedback on a 25-year provincial water strategy. Last year’s discussions with key stakeholders indicated that water is a key provincial resource that is extremely volatile due to the prairie climate and recommended that the government establish provincial and sectoral water management goals. The government proposes establishing a new corporation that would be responsible for consolidating government's core water management expertise and reduce current overlaps. William G. Moseley argues that the drought in the Midwest could be beneficial if it inspires greater crop diversification and decentralization. Did you get a chance to see the film about the Maldives, which are flooding due to rising ocean levels? If not, here’s a 45 minute video discussion with Bill McKibben (350.org) and Jon Shenk (the filmmaker). Applications are now being accepted for Next Up, a leadership program for young people committed to social and environmental justice. The deadline for Next Up Saskatchewan is September 14. Youth ages 15 and under and 16 to 21 are encouraged to apply for the Paul Beingessner Award for Excellence in Writing from the National Farmers Union. The essay topic is “Cooperatives: An Exercise in Democracy,” and there is a $500 prize in both age categories.